The second planting was also a grand affair though the crowd was somewhat smaller as 100 trees were to be planted. A full list was published earlier in the week. The New Town Council panted a further 14 trees to add to the 50 trees in the previous August. 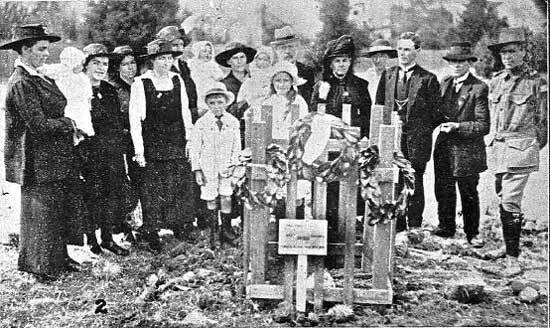 The fact that the war had by now ended made this a somewhat different affair without the raw emotion of August, the calls to patriotism or the remarks about 'shirkers'. The Governor's speech is more thoughtful than that of the hastily conscripted Chief Justice and eloquently describes the commemorative purpose of the Avenue. The Avenue was to expand to over 520 trees with the search still going on to find descriptions of these later plantings. There are no photographs and the Hobart City council Reserves committee minutes are silent on the matter. Delightful weather, complete arrangements, and the beautiful surroundings conspired to make the second tree planting ceremony in the Domain on Saturday most successful. 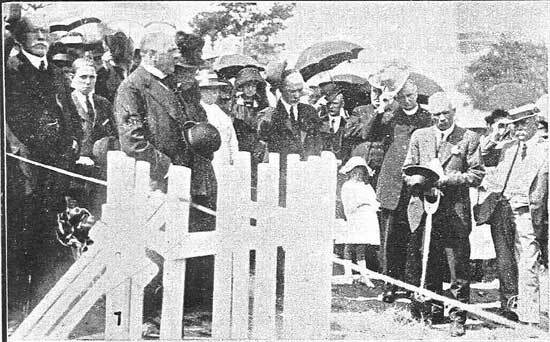 The Governor and Lady Newdegate, attended by Captain Stopp, were present and commenced the ceremony by each planting a tree at the city end of the avenue near the railway station. The attendance was not as large as on the first occasion owing to the numerous other functions taking place. On Saturday the ceremony took place in the calm of peace and the relatives of the glorious dead and the heroic living undertook their task with the calm serenity of victors, knowing well that the men whose memories were to be honoured had not given their lives in vain. After having banked the earth up around an oak that had sprung from an acorn from Gallipoli, His Excellency said:- The words I shall say will be few. It was a great disappointment to my wife and myself not to have been present when the planting of this avenue first took place. I was unable to be present and my wife did not like to once without me. I think that whoever suggested the planting of these trees, as a memorial to our fallen soldiers was possessed of a very beautiful idea. We all of us want to show our respect, esteem and gratitude to those men who have given up their lives for what they considered their duty. They have, by their actions and their heroism, saved our country and our Empire from the terrible things which might have befallen us had not our gallant youth of the Empire come to the rescue and fought their battles in the way they have fought them. Their memories will never be lost ion their won families, nor will they ever be lost in the minds of all who know what is good and glorious in eth history of our country and the Empire. It is easy to put up monuments of stone to their memory, and we are glad to do so, but I think the idea of planting trees, which, as the years go on, will grow and increase, is splendid, because when people come and walk along your beautiful domain they will see those trees growing, and will always be reminded that they were planted in memory of those who, without fear, had gone and done what they considered their duty. The sympathy of all us goes to the families who have lost members in this war. I think it must be a source of pride to them to think that they are able in the neighbourhood of the city from which many of these gallant men enlisted, to plant trees which they will be able to look after always, and which will stand as a memorial to those men who have gone. I feel very grateful to a fried of mine in Victoria, Mr Winter Cook, who has given me this little oak tree which you see here. It was brought by a nephew of his who has Tasmanian blood in his veins - Captain Cook a member of the Victorian army - as an acorn from the Gallipoli peninsula, a small corner of the world which will always be remembered in history as the place where the gallant men of your 1 st Division did such stirring deeds. This little tree actually comes from an acorn that grew on the peninsula and here it is planted in your beautiful domain. I am sure it will be a labour of love with the people of Hobart to see that the trees are properly looked after. I think and hope it will be of interest to you to have this little tree actually springing from an acorn, which came from that place, which has given us such glorious history. May I say, as the King's representative here, that I am only doing in a small way what he would have done himself. He glories in his soldiers and sailors and the fine spirit which has gone through all classes, grades, and sections of the British army, and he always wishes to do honour to our soldiers and sailors who have done so much honour to our history and traditions. By the grace of God, we hope this war is now over, and we trust that those who are to come after us will not have to go through the hard times that the youth during tehis war, with their fathers, mothers, brothers, and sisters, sweethearts and wives, have had to go through during the past few years. I think we can only thank God that at the end of this was victory has been give to our Empire and our brave Allies. I feel very deeply the honour of having planted this tree in your Domain. I think that the whole of this Avenue as it grows and becomes more beautiful as years go on, will point to future generations of Tasmania how the young men of today so nobly did their duty, and gave their blood for the cause they considered right, because they thought it was their duty to do so. Lady Newdegate then planted a laurel from the forum in Rome. The tree planters then went up over the hill to the portion of the Avenue opposite Government house, where 100 cedars within new guards awaited them. Little family groups gathered around these, and packed the earth about the young trees. His Excellency and Lady Newdegate each planted a Moreton Bay fig at the Government House end of the avenue, which is the only portion of the avenue incomplete. It will take about 50 more trees to complete the scheme. It is hoped to have them planted by the winter. All trees planted to date are thriving splendidly.